Born and raised in the hood of Portland, Oregon, over the years, Rob M. Miller has been victimized by violent attackers; thrashed violent attackers; enlisted in and honorably mustered out from the U.S. Army; taught martial arts; and worked in security, video store clerking, window washing, tire retreading, and store stocking. After two years of freelance stringer work and a number of publishing credits, he tired of nonfiction and turned to use his love of the dark, his personal terrors, and talent to do something more beneficial for his fellow man—scare the hell out of him! 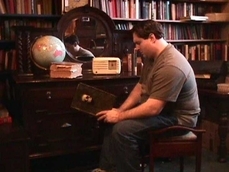 His work can be found online at the TheHarrow.com, as well as in American and British horror anthologies. He moderates a writer’s site at www.writers-in-action-spruz.com, and his own website can be found at www.robthepen.pigboatrecording.com. Rob's story, "Change of Heart," was published in Zippered Flesh: Tales of Body Enhancements Gone Bad! His story, "For the Love of Boys," appears in Uncommon Assassins.